One day while searching online for small home inspiration I came across The Beekeeper's Bungalow. 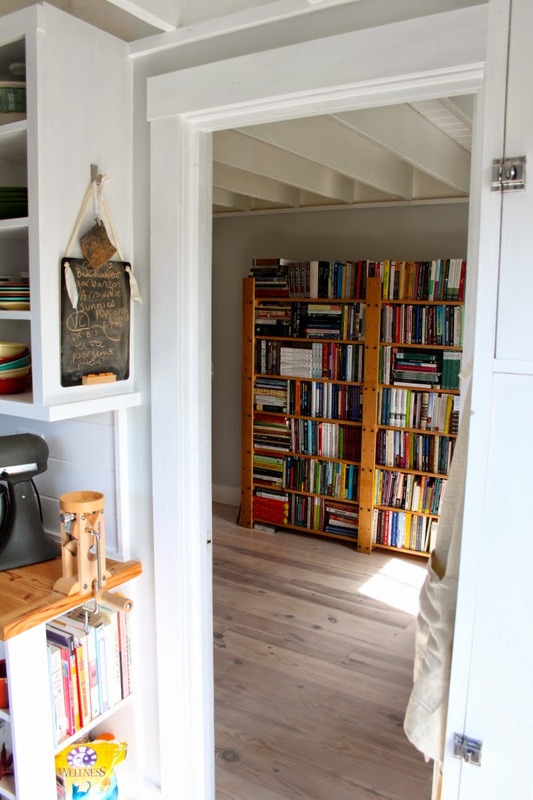 I instantly fell in love with this charming small home built by the owners Shawn and Jamie Dehner, and invited them to share the story behind it on Living Large in Small Spaces. I'm so happy they said, "Yes." It's my great pleasure to welcome this extraordinary couple and their work to A Joyful Cottage. This is their story, told by Jamie. Enjoy! In our mid thirties, Shawn and I decided to undertake a homebuilding project. 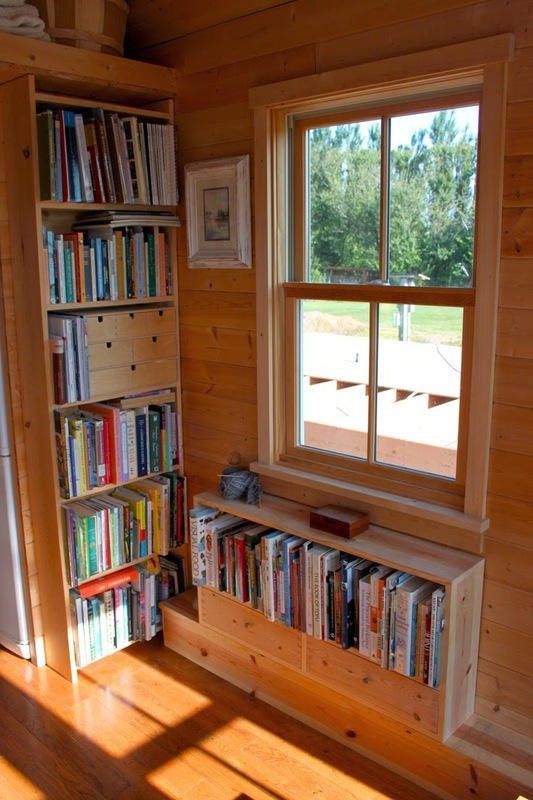 We had learned a lot from remodeling and books, and wanted to give it a whirl. The first home we built ended up being located in Maine. It was bigger than we wanted/needed and we missed our home on the west coast. Once we moved back home we decided to design a house that was cottage-y and would fit well in the beach town where we lived at the time. The area is full of small cottages used for decades by vacationers and we wanted to keep that theme going with our addition to the architecture. We also didn't want to build too large again, which is surprisingly easy to do. To start the project, we built a tiny house to live in while designing and building the big house. We wanted to remember our East Coast adventure and so kept the style somewhat austere, but gave it a west coast bounce by painting it orange. 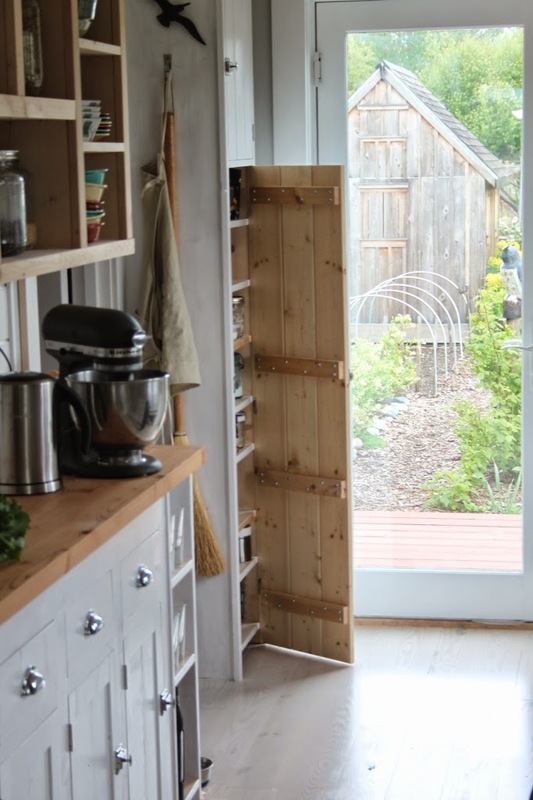 Since the time we lived in the cottage wouldn't be short and since we are big on cooking and do a lot of DIY projects in and out of the kitchen, we tried to give the tiny space the ability to perform for us. 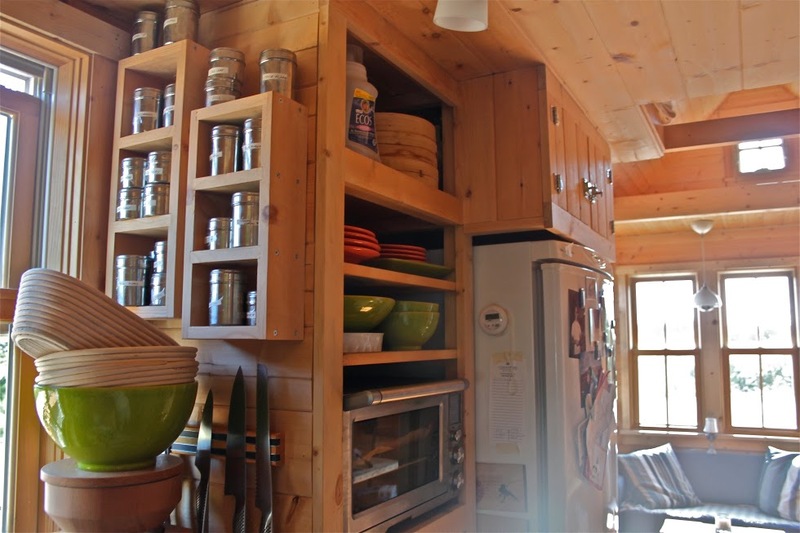 We included a micro-kitchen with big kitchen features, including a full sized fridge, space for a high end toaster oven, a small cooktop, and cupboards and cabinets for storing our kitchen essentials. We also wanted a bit of a living room space that would allow Shawn to do his drafting work on the computer and space for our many books...no matter how small a space we live in, getting rid of all of our books wasn't an option! Above all, we wanted high ceilings in order to prevent a cramped feeling from resulting. We also needed a clean, reasonably spacious and cozy place to sleep. The overall project was really successful! 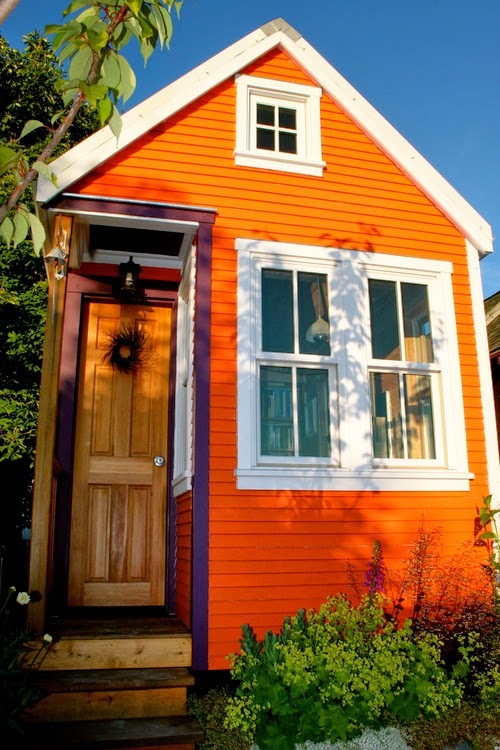 The tiny cottage became a neighborhood landmark and we got a lot of friendly inquiries about it. 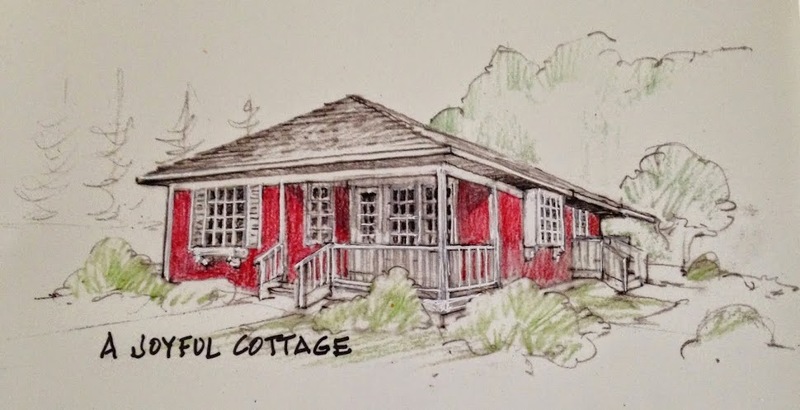 Once we moved into the big house, we used the cottage as a vacation rental (advertising through airbnb) and a great space for visiting friends. Our next project was a bit more ambitious in terms of scale, but the overall floorplan was about 765 sq. feet. We called it The Beekeeper's Bungalow, since all houses need a name and we were stewarding several colonies of healthy bees in town. 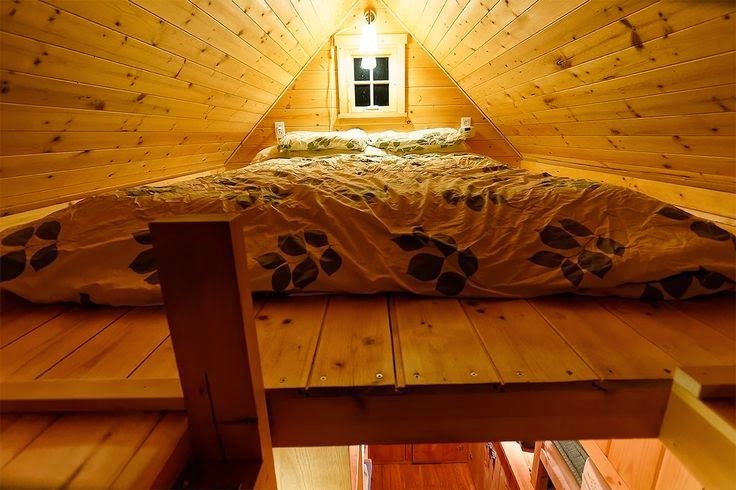 Our goal was to do nearly all of the work on it ourselves, so keeping it a cozy size (and not too high, as the "lead foreman" is no fan of heights!) was important. We wanted to achieve a few other goals in terms of design; we wanted a traditional design and went with a bungalow type style. We went with an 18 x 32 footprint and chose to build the house using a balloon framing technique that allowed for a very strong, one-and-a-half story building. We only hired outside help to shingle the roof, pour the foundation and check the electrical work. 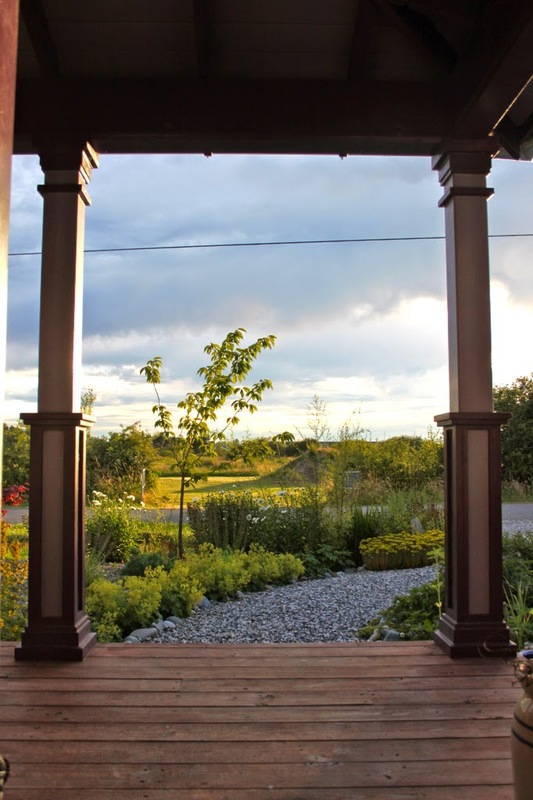 We also wanted a big porch to sit on and watch the fireworks in the summer as well as to to enjoy some of the fall and winter days with not too cool temperatures but guaranteed abundance of rain. The porch was great fun to build. 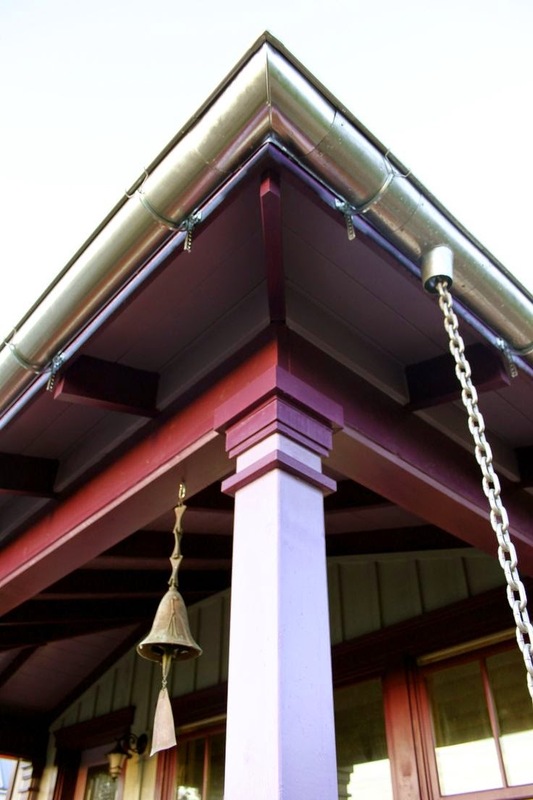 We chose to build up the pillars using scrap wood from the building/trim project and use contrasting paint colors to bring out the effects of the wood trim. We framed the house over the summer and then set about finishing the interior. While designing and building, we had worked with the ultimate goal of reselling the property. Since the area is one that attracts many second home owners, we knew that a palace wasn't required or even desired by many prospective buyers. We realized that a small space, well designed, would be just perfect for our needs as well. The living room area was small but full of windows, the main ones opening to an expansive view to the west. 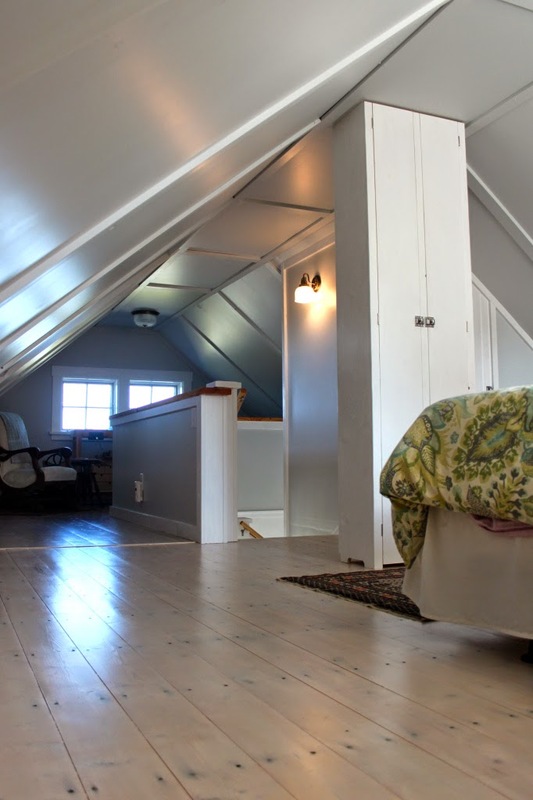 The open joist ceilings, bright and white, added height to the room. We included a propane stove and built a simple mantle around it using a big piece of lumber discarded at a building site. Shawn planed it down and it had a nice feel. 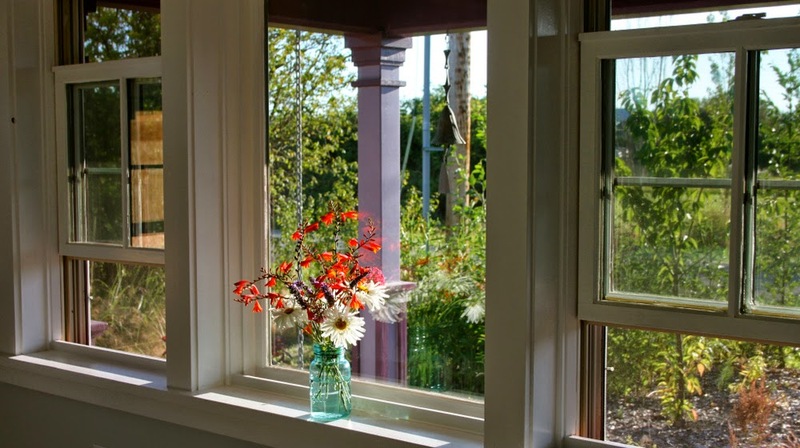 Shawn built out the deep jambs on the windows and made the sills nice and wide for cats to perch, vases of flowers to brighten things up and a generally substantial feel. While framing the staircase surround, we added a built in that allowed for an "entertainment" nook and made room for in-wall speakers. The stair case took up a lot of the space on the first floor but we made the best use of all of it. Aside from the visual beauty, there was a large closet under one part of the stairs and our laundry center was tucked under the other side. The kitchen needed to be large enough for lots of great cooking to take place as well as to provide access to our back garden (where many of the ingredients could be freshly picked!). We included a clear glass door leading out to the garden and back deck. The glass door also lent a long visual line thru the house overall, a design technique we included to avoid the home feeling boxy or walled off. We built the fir countertops ourselves and sunk a huge apron sink in it, right across from the kitchen dresser that Shawn designed to hold my many large jars of grains, beans, etc. We built the framing for the cabinets to include the possibility for doors to be added later by ourselves or future owners. We found the galley kitchen to be a good fit for us. 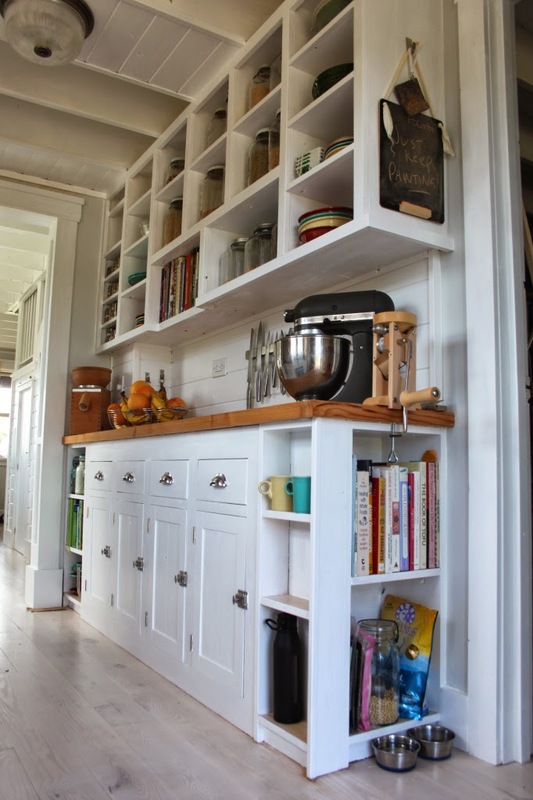 Lots of storage made it easy to keep an uncluttered look and yet store many kitchen tools and foodstuffs. We also loved the way the open shelving allowed for the display of bright and cheerful plates and books. We included a first floor bedroom/office off the kitchen. Keeping the options open for usage made it helpful for us during our time there and left a variety of options for future owners. The other important design feature we included was a bathroom with enough space for a deep soaking tub and all the usual amenities. We built a big linen/storage closet into the hall so that the bathroom could be its own space. 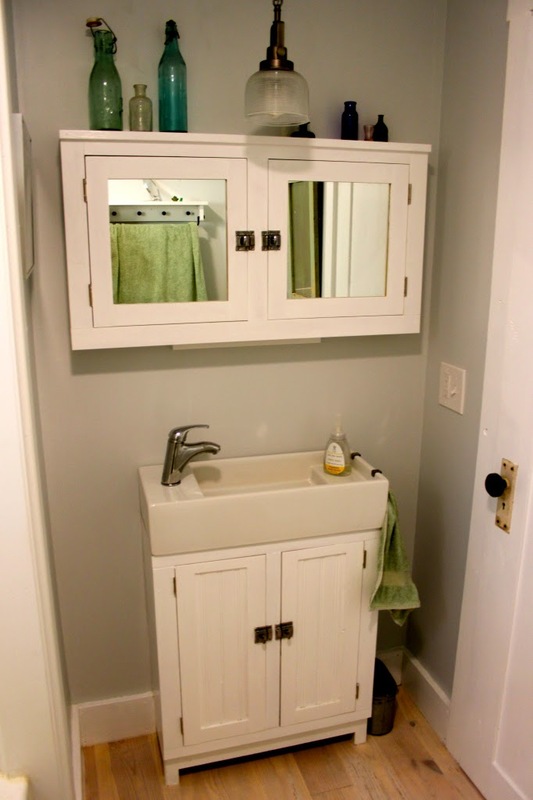 We found a tiny sink top with a nice Scandinavian design at IKEA and Shawn built a cabinet for the underneath along with a medicine cabinet. 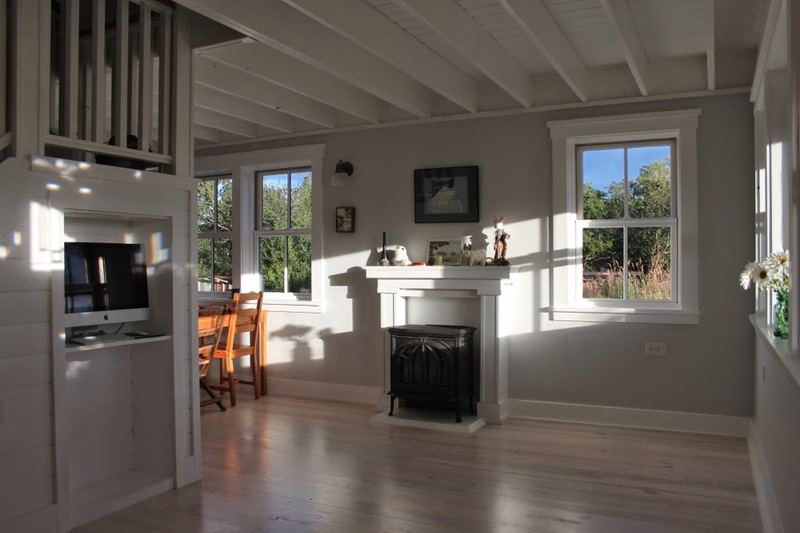 Upstairs was a large bedroom tucked cozily under sloped ceilings and a big east facing window welcomed the morning light. 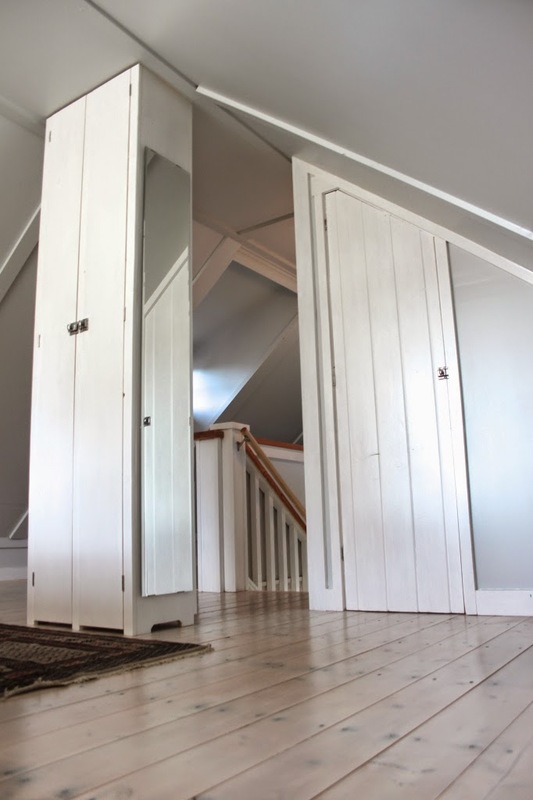 One half of the second floor was much larger than the other to house a queen sized bed, closet, and cupboards for storage. The other half we envisioned as a cozy reading nook for rainy days or a space for art projects, with western facing windows allowing us to watch some of the dramatic winter storms. It was the coziest part of the house and really felt like a place away from it all. All in all, we wanted to build a little cottage in our town that would compliment the location by keeping size appropriate but also incorporating a time tested style that could be appreciated by many. 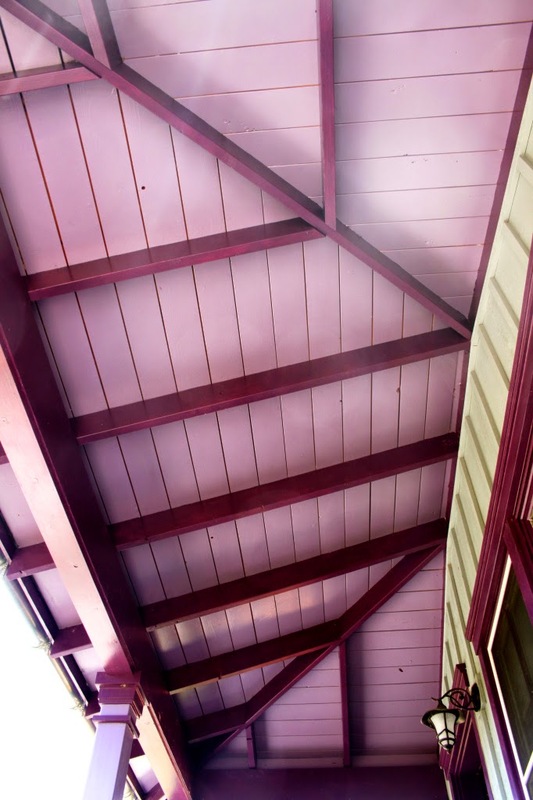 We chose natural but bold colors for the house exterior, thus the silvery green walls and the shades of purple in the trim, meant as a nod to the lavender that is one of our garden favorites. For the interior, we wanted to embody the brightness of a traditional beach neighborhood and so emphasized all the trim work with clean semi-gloss white. The walls had just a hint of blue in them to allow for some contrast with the trim paint. The floors we hand sanded and whitewashed with a natural stain. Overall, the effect was to enlarge the interior while creating a sense of peacefulness. As a vacation cottage or simple home for a couple, individual or family, it was perfect - low maintenance, clean, bright and soothing. Everything that was necessary had a space. We were both intrigued by the many visitors, people from all kinds of different backgrounds, who frequently commented upon entering the home, Wow, this is really spacious! I was expecting it to be really small... . As they toured the house, there would occasionally be an incredulous, "How did you fit this big bathroom in here? That's amazing!" And this was very gratifying! 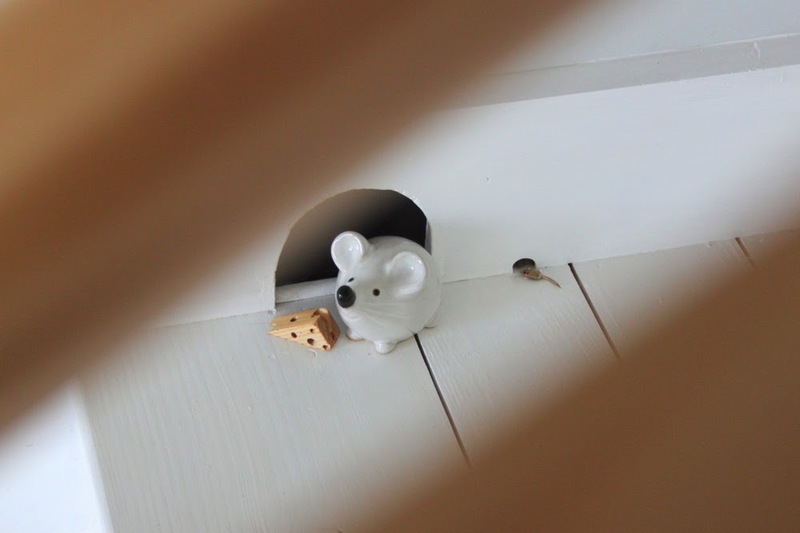 Last of all, we made sure to give the home a guardian by including a little hand cut mouse hole in the stair mouldings, a good place for Valentino, our resident (ceramic) mouse to set up shop. It turns out that the Beekeeper's will not be our final home building project. We were delighted to find a small acreage, at last, that was in our price range, gets plenty of sun, and doesn't require the clearing of a lot of trees or a ton of site work to get started. 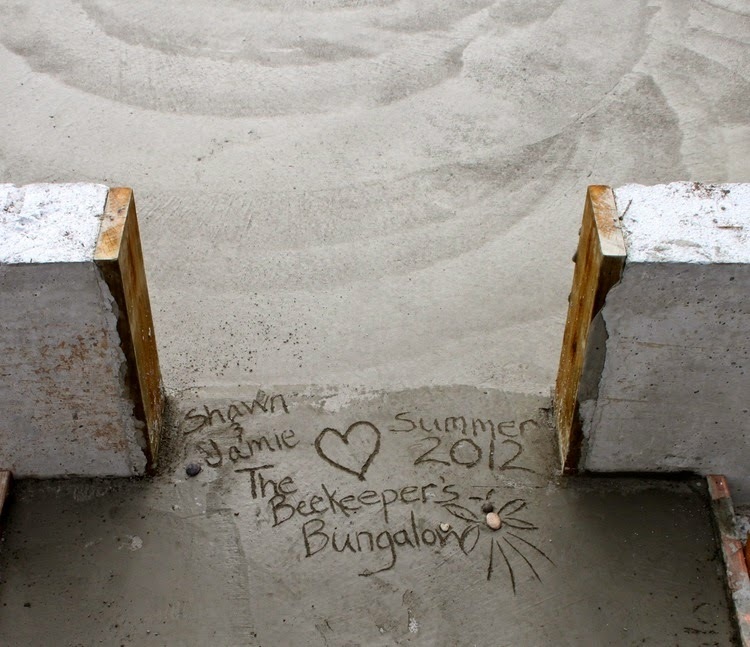 We sold the Beekeeper's Bungalow this past October and are now renting and designing our own home, which we hope to commence in Spring 2015. 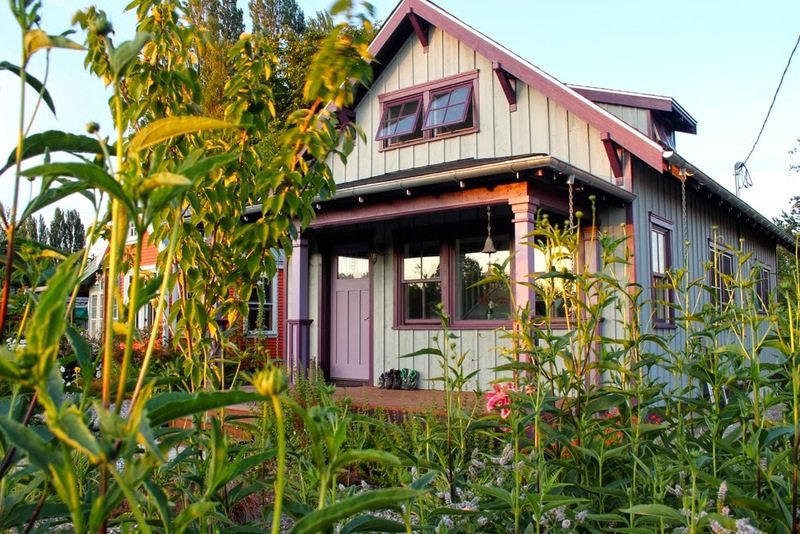 Our progress can be followed at our website, dedicated to free-sharing small home plans and projects, drafting small houses, and more, at thesmallhousecatalog.com. Thank you Jamie and Shawn for joining us today and inspiring us with your vision and creativity. Do take time to visit Shawn and Jamie's beautiful website. 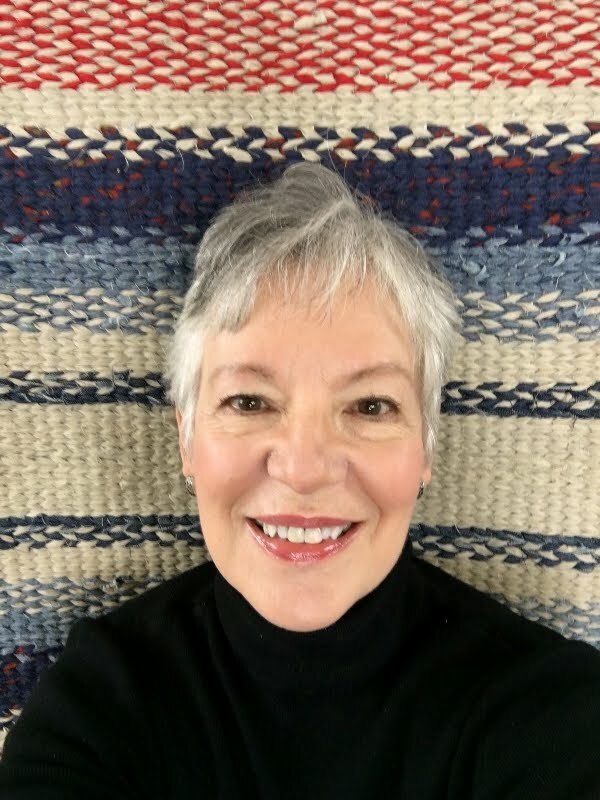 They have a great blog with loads of information about home construction and simple living; offer freeshare home plans designed by Shawn, as well as drafting and design services; and you'll see lots of photos of their work. Check out the cute and fun "short videos" they've made -- they're sure to brighten your day. The Beekeeper's Bungalow was featured here. Thanks so much for sharing. I have never seen this home before and it is super charming! :) I just love that mouse...now I am on the hunt! Love this series Nancy and these cute cute homes. These two are no exception. How cute and wonderful they both are. What a great use of small space. Love the little resident mouse too. Is there anyway of getting a plan safely? Buy,? Help! Hi Stacey. You're a "no-reply" blogger, so I'm unable to reply to you via email. I've forwarded your comment to Shawn and Jamie, and I suggest you contact them so they have a way to reply to you. Here's the link to their contact page on their website:http://www.thesmallhousecatalog.com/about/. You'll find what you need there to get help. We tried responding to Stacey's comment through the comments section but it didn't post for some reason. We both think that the virus must have come from elsewhere. We do all of our work on the mac using non windows platforms and that virus is a windows virus. We also employ virus/malware and hacking software via our third party website service. Over 8000 downloads have been made of our free plans with no issues whatsoever, including several today. So we are somewhat baffled. We did rescan our computers and no viruses were found anywhere. We will happily try and assist Stacey if/when she writes to us. I am sorry that she has had that problem, but we genuinely don't think the issue is on our end of things. I am a minimalist and I love to keep things simple, yet beautiful, and I love things to be clutter free and organized, so you can only imagine how much I enjoyed this post. Thank you so much for sharing! Simply amazing...and as the visitors commented, it is much larger than initially suspected. Just love it! Thanks for bringing us such a great feature. Best of luck to this talented couple on this new endeavor! Smart and beautiful small home. I look forward to checking out their website. Thank you for sharing it with all of us, Nancy! Their website has lots of great information, Lin. Enjoy! 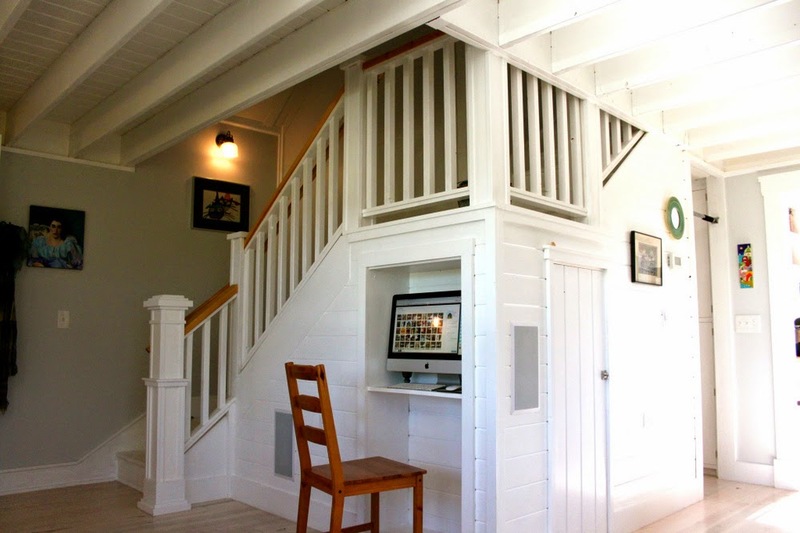 Another fantastic peek into charming homes, Nancy :) I just love all of the painted white woodwork and the efficient use of space in the Beekeeper's Bungalow. 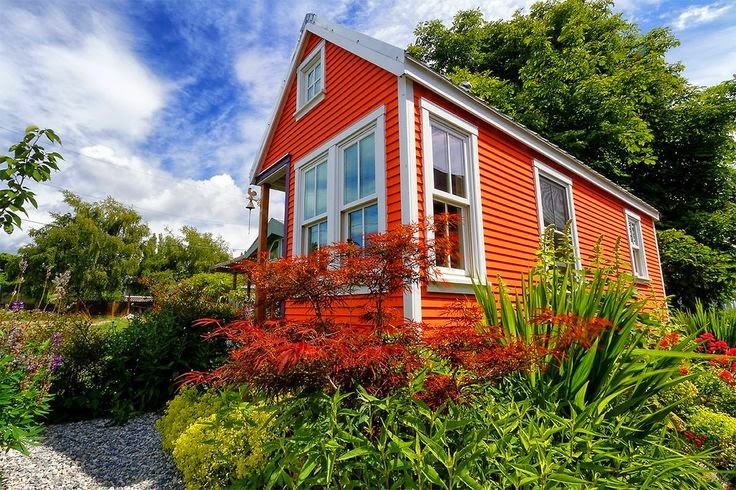 But that orange-painted cottage is to die for, too! What fun! I love that you post these - thanks so much!! What an awesome couple they must be - their talent for design and actually doing most of the construction themselves is truly admirable. I love both little homes. Their attention to the details are perfection - and that mouse just brought a huge smile - I will definitely check their blog. Thanks for sharing this great story Nancy. Both houses are well thought trough and feek so cosy and light. 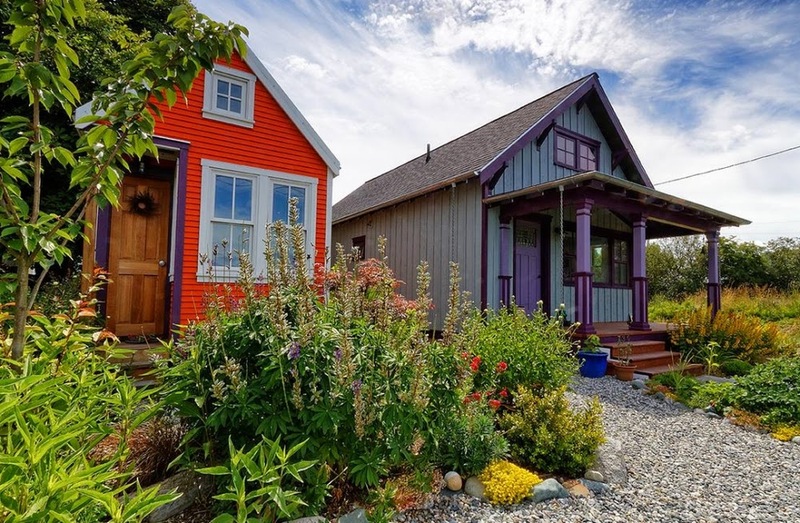 These cottages are TOO cute for words! 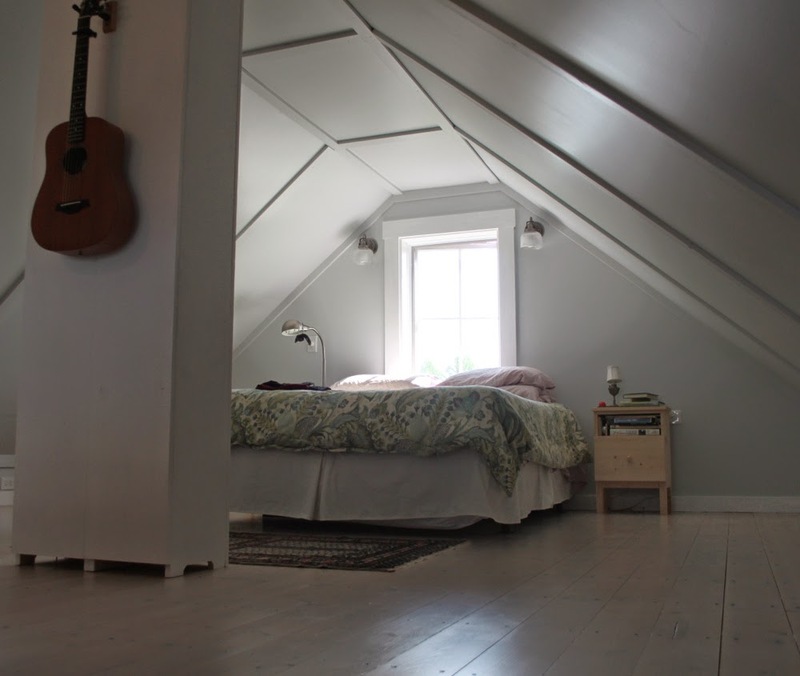 I especially like the bedrooms in both - simple, practical and pretty. 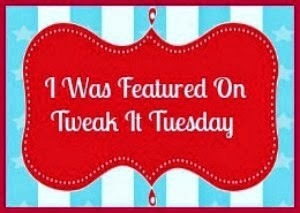 Thank you for featuring this most talented, decorating duo and their delightful dwellings! Utterly fascinating and amazing...both spaces! Can't get over them ! I'm glad you enjoyed Jamie's post, Deb. Thanks for stopping by. Gorgeous home! Every space is intentional and uncluttered. I love the overall style of the home and the mouse cut out was so cute. Beautiful! I am learning more and more. 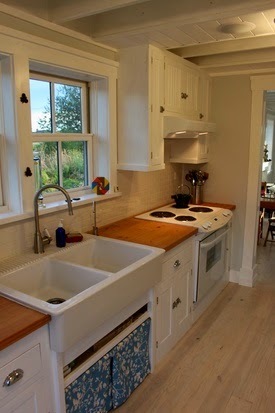 I really love the kitchen ideas. 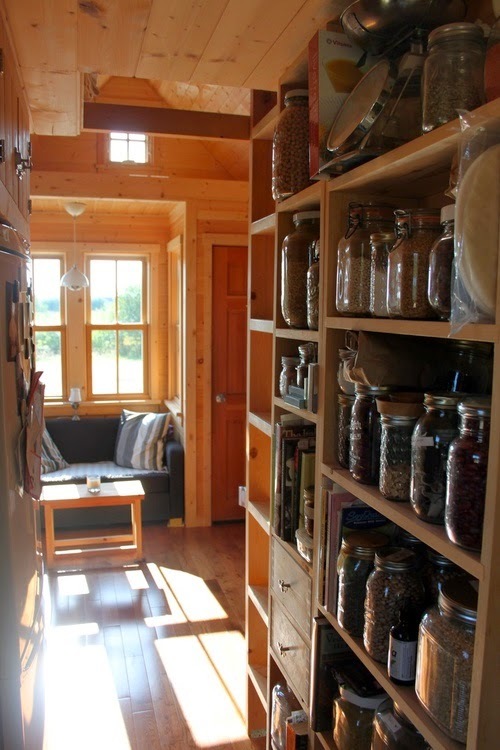 Great ideas with the jars and open shelves. It is beautiful. What an absolutely charming bungalow! I love all the finishes they chose for a light and airy look. So inspiring!! Good gravy, this one has me speechless. Genius use of space and color! What a clever couple ! 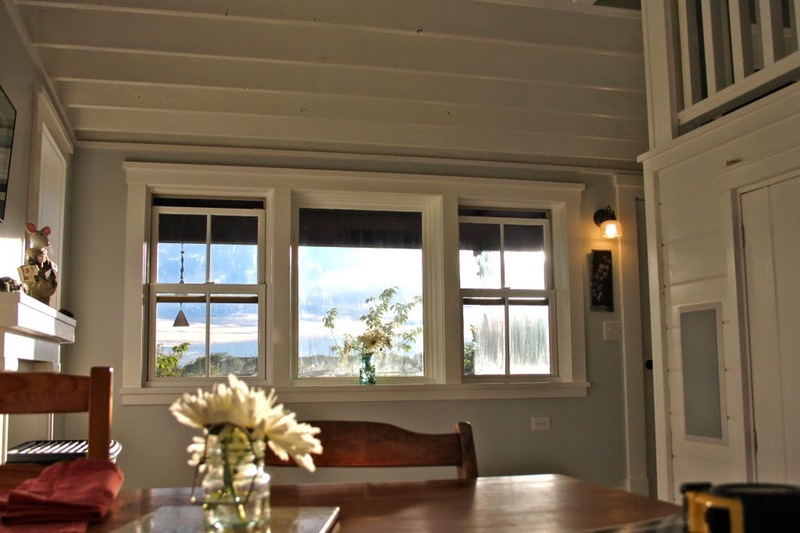 Both homes are so lovely, so well thought out and I love all the painted wood and white ceiling joists in the bungalow. That kitchen is gorgeous. I've finally written another post and I started decorating my hall on Tuesday and it really was you who inspired me to get a move on, so thanks again Nancy. Oh they were masters at great usage of space!! It even photographs spacious in the main living area. Fantastic! Wow, what talent this young couple has! Loved both places, but especially the beekeepers cottage. 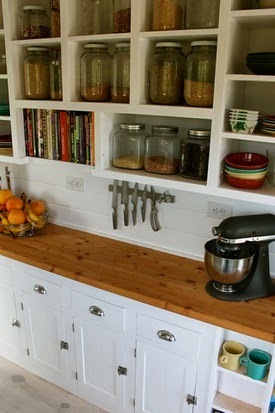 The open kitchen shelving is darling and I love the extra wide window sills. Thanks for sharing with SYC.